Switch owners have binged on a rich diet of sophisticated 2D platformers of late, and sometimes what's needed is a gaming palette cleanser before you dive back in. In that regard, Broforce is like an action-platforming sorbet in between meaty courses of Dead Cells and Hollow Knight. It's big, dumb, disposable fun in the best possible way. You play the role of an '80s action movie caricature. Which one? Pretty much all of them, actually. As you run-and-gun from left to right, your pixel-art hero will encounter caged allies. Blast them free and they'll join your ranks. Not only will this gain you an extra life, but control will instantly switch to this new member, complete with a new set of characteristics. 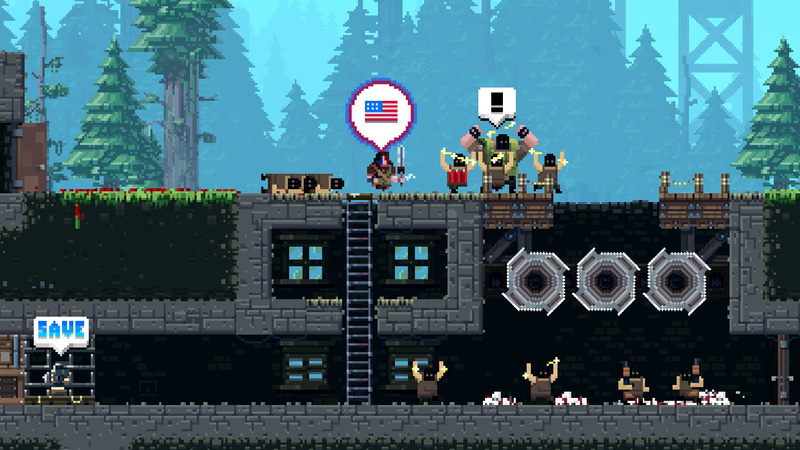 It's the nature of these playable characters that gives Broforce a large part of its brash charm. They're all based on well-known action movie characters, largely lifted from the genre's heyday in the '80s and '90s. So there's Rambro, a clear take on Stallone's battle-weary 'nam vet, complete with an M60 machine gun and a stack of grenades. Or Bro Hard, essentially Die Hard's John McClane with twin sub-machine guns and flashbang grenades. Those are two of the least interesting protagonists, too. Mr. Anderbro is Neo from the Matrix by another name, with a deadly melee attack and the ability to defy gravity. Bro Dredd has homing bullets and a guidable warhead special. Bro In Black's tiny laser gun kicks like a mule - in both directions. And so on. These characters unlock after a set amount of rescues, and you'll be revealing distinctive new Bros deep into your time with the game. 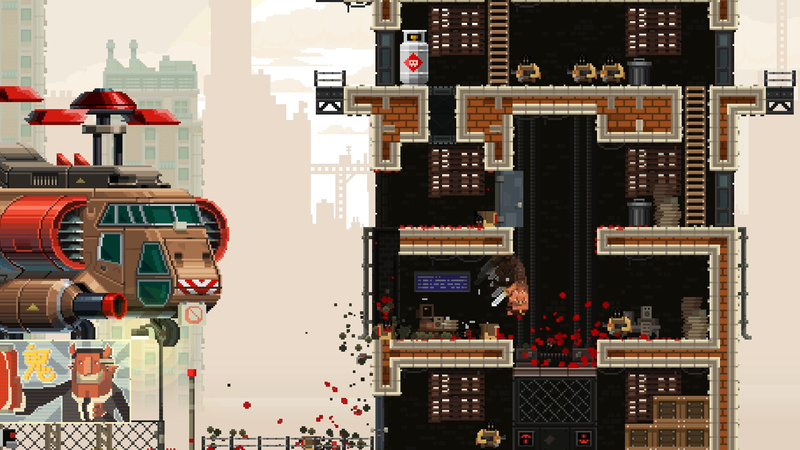 Fortunately, Broforce has more than the novelty of its controllable characters on its side. Each level is a bullet-strewn run through a bunch of heavily-armed grunts, culminating in the messy assassination of a devil-like figure, and occasionally a hulking boss. The levels themselves are fairly simplistic, but where they impress is in their deformability. Coupled with the fact that they're unusually tall, you'll find that you can literally blast your own path through them, hewing out makeshift tunnels or just levelling a troublesome guard outpost. Explodable barrels sit there just waiting to be ignited, while bridges are only ever a few shots of your weapon away from total collapse. If anything, the relentless action and easy access to total annihilation can grow a little wearisome. Broforce is a game to be played in short, sharp bursts, lest the one-note action grow too repetitive. Its controls can be a little finicky, too. While the weapon behaviour is both pleasantly varied and satisfyingly tactile, your character's movement feels a little clumsy. Navigating ladders and climbing sheer walls with your knife are a little too jittery for their own good, which can easily lead to silly deaths. That becomes more pronounced as the action heats up and the bullets really start to fly. And believe us, they really do start to fly. The action gets even more hectic and destructive in a co-op mode for up to four players - something that seems perfectly at home on this Switch version. 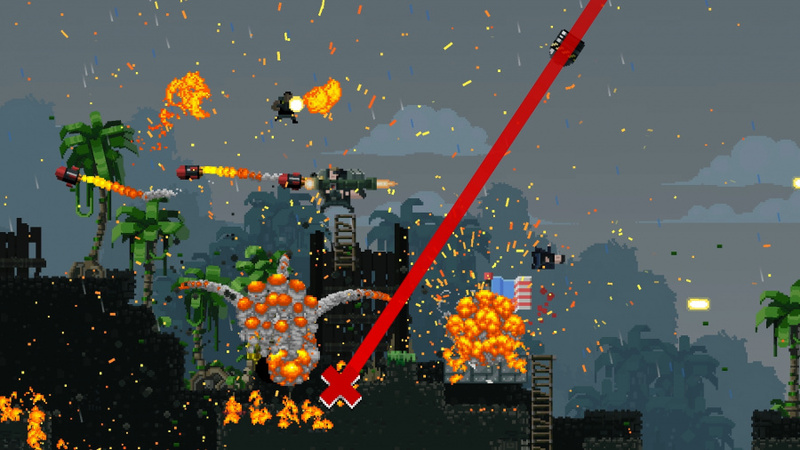 There's no denying Broforce's capacity to amuse and thrill in often ludicrous amounts. Its silly sense of humour (it's all played with a tongue-in-cheek, overtly macho tone) and crazy levels of action serve as the perfect filler between more substantial fare. It's a fun enough game but I found the joke wore off a bit too quick. Played it for free as PS+ member a few years ago. Fun little title, gets a little boring after a while. I bought it so fast it was embarrassing. Love these "relaxing, but not really" action games! 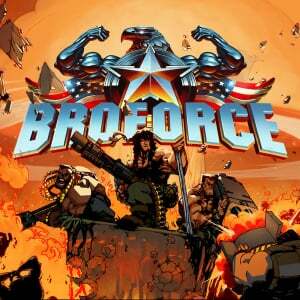 Really enjoy Broforce,great little game! Conan the Barbarian is absolutely useless though. I don't think I've lasted more than 10 seconds with him. Arnie would be disgusted if he played it. The Terminator is great though. Maybe I'd enjoy it less in a different situation, but I have had some truly awful days at work the past couple weeks. My downtime with Broforce has been nothing but smiles however. Every one of my inner-child's heroes thrown together in punderful and addictive gameplay. The end level music reminding me of Mighty Morphin' Power Rangers doesn't hurt either. Beat the game on hard a couple days ago. Ironbro is probably beyond me though. 9.5 out of 10 for me. "Broforce kicking ahhhs for justice and liberty! "-watch the cartoon trailer on youtube. It helps the happy. it also doesn't hurt that I was raised on Terminator, Robocop, and the Aliens movies. Great game, bought it for €3 a few weeks ago on PSN. Might buy again if it gets discounted. This classic deserves a 9 more than most of these indies that scored a near perfect on this site. If this game gets boring, you don't have friends to play with. Switch version seems to run better than PS4. Does this game feaute the odd slowdown the PS4 version had?! Fun game, but I don’t see myself playing it again. Action movie caricatures does it for me. Co-op, run n gun, destructible environments, and just a good time wasting filler game? Sounds like this needs to be on my Switch. I got this for $1 through a PSN sale a while back. That's about how much it was worth, entertainment-wise. It's interesting how different the game feels if you play it alone vs. Co-op. I watched a 4 player let's play and it was pure chaos. But if you play it alone you actually have to use some strategy or you will die quickly. Because of that it feels a bit slower and less random. I love playing this game on PC (it's the ultimate "laptop" game), and I'm happy to hear the Nintendo version doesn't suffer from the same issues the PS4 version did at launch. I'm holding off on double-dipping until there's a massive sale though because the Nintendo version doesn't include any of the user-generated levels (or the level-editor) which vastly extends the play value (and also because I only paid $3 for the PC version on Steam). Fun caricatures of 80s and 90s action heroes and heroines for those who grew up with them. Had loads of fun with this on PS4 playing co-op with my sister. How this game hasn't been shut down I don't know. Adding bro to the names does not change the characters at all. We all know who they are! Still, I'm glad it hasn't been! This game is awesome. Been playing the crap out of it since it was released. If you like run n' gun shooters like Contra or Metal Slug then you gotta check out Broforce. The destroyable environment and platforms make for a great gameplay twist too. It's got a Dig Dug aspect to it, as you constantly fall through structures, avoid falling obstacles, explosions and gunfire, and forge new pathways to victory, all while blowing the living hell out of everything in site. The drop-in-out online multiplayer works great. It's fantastic action and lots of fun. I disagree with the reviewer saying this game is only good in short bursts. I've been putting in 2-4 hour sessions at a time and it's glorious. This game is a lot of fun and it’s perfect for breaks in between sessions of Dead Cells & BOTW.Its the kinda game that punches you right in the grandma. But does this version come with the Expendabros DLC or not? I remember playing it for quite some time (I beat it alone and with a friend) through PS Plus. The PS4 version used to hurt really bad going down to a really bad frame rate. And that was the PS4? I saw a comment about Switch handling it better. Is it true? Can others that bought it confirm that it runs steady on Switch? Thanks in advance. I'm about almost half way through the campaign and have played with 2-4 players the whole time, and I haven't noticed any performance issues so far. The framerate does take a hit sometimes but nothing that has interfered with gameplay. In fact I've been impressed by how well it performs, given the level of action on screen. @Medic_alert they're parody characters and in the US at least parody is a protected artform. That's how Enter the Gungeon also gets away with guest appearances by parody characters that are clearly Sonic, Link, Ganon, and hundreds of items from various movies and games. @onex not as of yet. No idea if they'll add them later. @Dahn_ on single player I've only noticed the framerate dive during the end of some levels when the stage explodes while a boss explodes. Otherwise its been very smooth through my 4 playthroughs. I was hoping to learn about its online component. Is it good? bad? useless? @whanvee The online component is one of the best parts of the game and it works great. 1-4 players, drop in out whenever you want, or create private lobbies; progress is saved for all players. It's a seamless experience geared toward smooth online play. I think it's easier to play with 2 players rather than 3 or 4, because it gets really crazy with 4, but it works regardless and is a blast to play online. @Alikan ahh thanks, good to know. I may wait for a sale in that case. You can play as a parody of Agent J with the Noisy Cricket?! Oh, this I've got to see! EDIT: Never mind. It's rated M and for good reason. Why'd they've have to ruin such a good game by including so much unnecessary blood? !